You have found the inventory satchel. Good! Next: Collect an item? < Click to open me. "What Parzybok has done here…is to revive the genre and make it relevant again. And by making the magical MacGuffin a beloved household item that nearly everyone has a complicated relationship with, he gives the story the depth and allure of the best modern literary fiction." 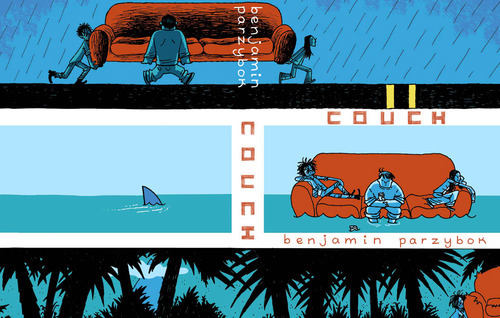 "Couch hits on an improbable, even fantastic premise, and then rigorously hews to the logic that it generates, keeping it afloat (at times literally) to the end." "Once upon a time, Donald Barthelme, Jonathan Lethem, and Umberto Eco attended a film festival together. The featured flicks were Kiss Me Deadly, Fitzcarraldo, and Repo Man. Inspired by this odd bill of fare, the trio set out to collaborate on a novel. 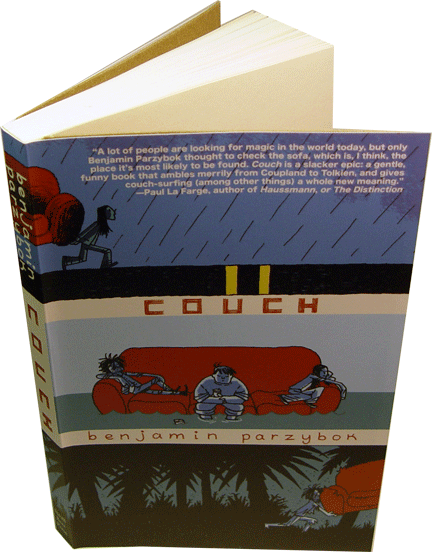 The result was Benjamin Parzybok’s debut, Couch." "Beyond the good old-fashioned story, Couch meditates on heroism and history, but above all, it’s an argument for shifting your life around every now and then, for getting off the couch and making something happen." 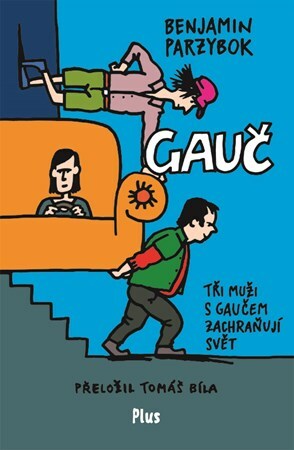 "Parzybok’s quirky humor recalls the flaws and successes of early Douglas Adams." "The book succeeds as a conceptual art piece, a literary travelogue, and a fantastical quest"
"It is an upholstered Odyssey unlike any other you are likely to read. It is funny, confusing in places, wild and anarchic. It is part Quixote, part Murakami, part Tom Robbins, part DFS showroom…It has cult hit written all over it." "One of the strangest road novels you’ll ever read. It’s a funny and fun book, and it’s also a very smart book. Fans of Tom Robbins or Christopher Moore should enjoy this." "An amazing debut novel about three roommates who get evicted and take their couch with them on a journey that becomes a epic quest that becomes one of the most truly weird and original books I’ve read in ages." Some adventures can be undertaken name-less. This is not one of them. This is your inventory satchel. Your gathered items, new destinations, and any actions you acquire will all go here. Good luck questing! 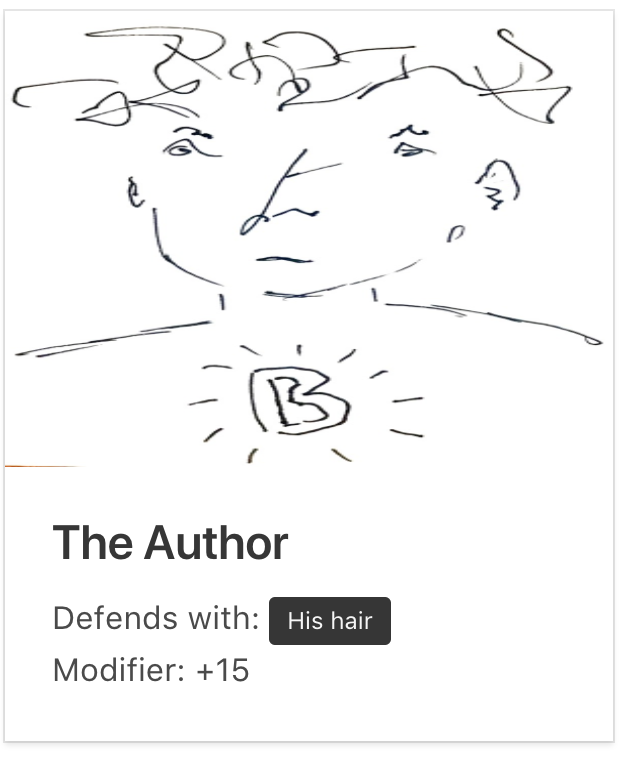 This is a game, built on top of a fairly boring straightforward author's website. It's part scavenger hunt, part narrative, part fight-scene. As you play, new items/destinations/actions will be added to your inventory satchel. If you lose the game or wish to become someone else, hit the 'start over' button. Tip Explore! Many peculariar things are clickable, hidden, or require a certain amount of time to be spent somewhere, or require interaction to work. And as you get deeper into the game, places that were once normal begin to alter. If you spot any bugs, irregularities, surprises, etc - drop me an email: ben@ideacog.net - thanks for visiting! I send a newsletter every almost never. You should subscribe.